Are you looking for a delicious appetizer to bring to a party? 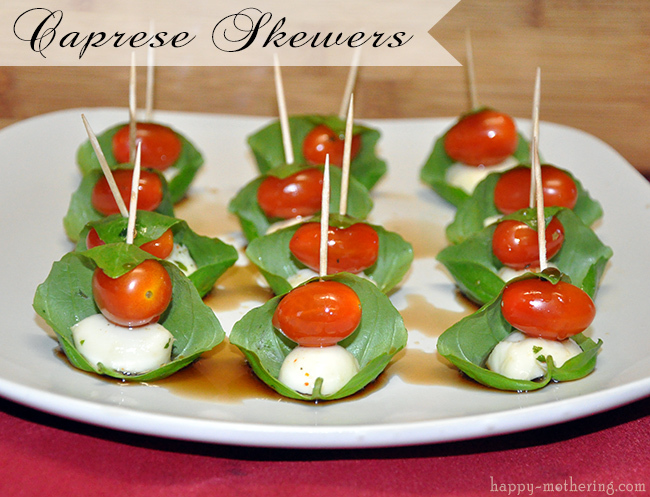 These caprese & antipasto skewers are easy appetizers to make on short notice! And they’re delicious too! Have you ever been invited to a party last minute? One where you’re expected to bring something to share with everyone? I think we’ve all had that happen to us. I hate feeling panicked, not knowing what to bring – but knowing that I want to bring something everyone will enjoy! That’s why I always have my eyes on holiday recipe ideas. I love appetizers for holiday parties because they’re easy to make, there isn’t as much clean up as with a full meal and there are lots of fun ideas! I love making warm, delicious appetizers, but sometimes you only have 30 minutes to prepare – and most of the time that’s not enough time to prep and bake! 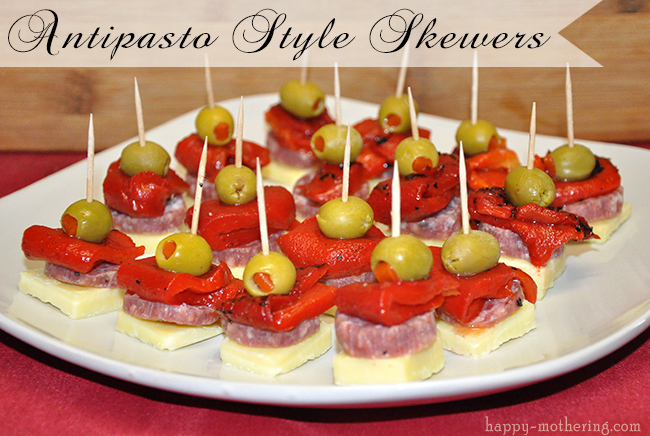 One of the easiest ways to throw together fun appetizers for holiday parties is to use skewers or toothpicks to create bite sized treats! Take your favorite meal or salad and convert it to an appetizer! That’s exactly what I did with caprese salad and antipasto salad! 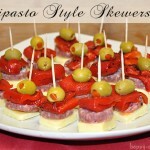 You can convert all sorts of yummy meals to skewer appetizers. We did the same thing with BLT Skewers recently! So yummy! 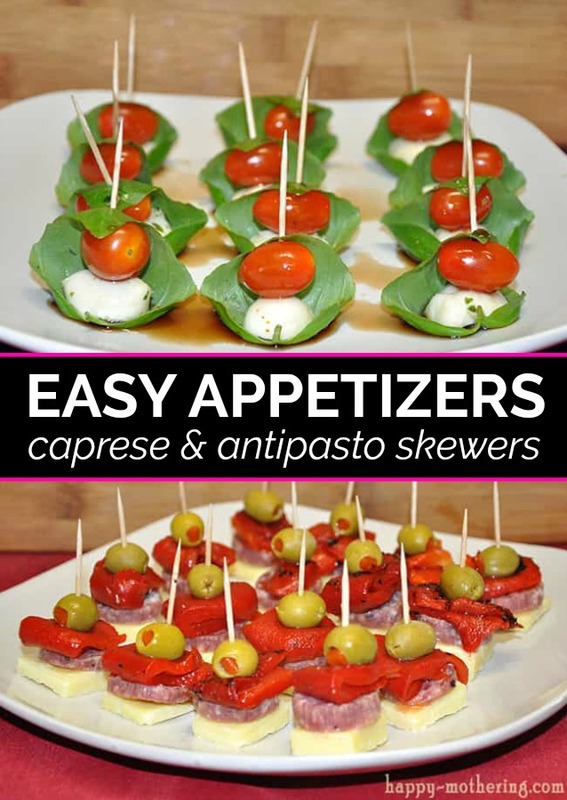 I hope you enjoy these easy appetizers as much as my family does! Caprese is one of my favorite salads. There is something just so awesome about how those flavors work together! I hadn’t had a caprese salad in while since I try to avoid dairy (even though I adore cheese more than I should), so I decided to turn it into an easy appetizer! 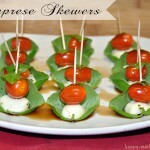 These caprese skewers are easy appetizers to make on short notice! And they're delicious too! Cut the mozzarella fresca balls in half. Wrap a large basil leaf around a grape tomato and a mozzarella ball half, with the flat side facing down. Stick a toothpick through the basil, tomato and mozzarella. Repeat until your plate is full. Drizzle some balsamic vinegar over the caprese skewers and plate. I grew up around the traditional antipasto salad in Italian restaurants. The ingredients are readily available and most people enjoy them. So, keeping on the same Italian theme as the caprese, we also made antipasto style skewers so we’d have a choice. We went with green olives, red peppers and a white cheese, but you can vary the colors. If you love a good traditional antipasto salad, you'll love this unique Anitpasto Skewers recipe. It features yummy ingredients including salami, cheese, peppers and olives. 48 Green olives green or black works! Layer your ingredients: cheese, salami, peppers and olives. Stick a toothpick through them then arrange on a plate or platter. Repeat until your plate is full. You should get around 48 antipasto style skewers from these ingredients. Please review this recipe after making it please! And be sure to Pin this Post so you can find the recipe later! Making Family Movie Night Memories with Guardians of the Galaxy + BLT Skewers! I love finger foods during the holidays. So easy and inexpensive and they get gobbled up in seconds. Caprese is my favorite too.